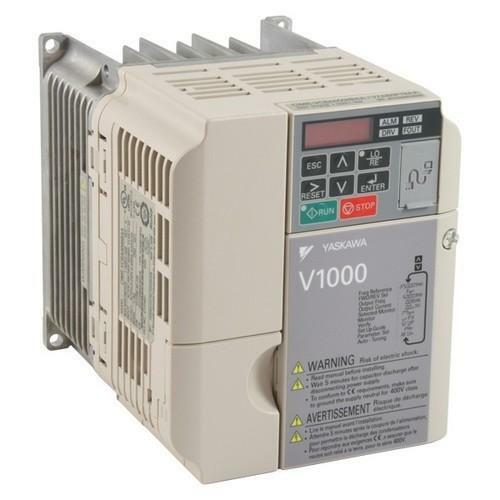 Yaskawa V1000 series AC inverter - China - Trading Company - YASKAWA. The V1000 is a world-class compact current vector drive that defines a new world standard. Demands for efficient production and better maintainability are on the rise, spurred by global competition. Yaskawa pays off the promise of being in control with products that make businesses move. The optimum balance of energy input, product output, maintenance risk, and long life is reached with Yaskawa. The V1000 provides a world of power in the palm of your hand! The V1000 is a world-class compact current vector drive that defines a new world standard. Demands for efficient production and better maintainability are on the rise, spurred by global competition. Yaskawa drives have earned a reputation for high performance, high functionality, and high quality. The V1000 provides a world of power in the palm of your hand! Power loss ride-thru: 0.5 sec. Short circuit current rating: 30KA rms sym.